BANGKOK — A crackdown on anti-government protesters in Thailand’s capital Saturday left at least 15 people dead and more than 650 injured, with no progress toward ending a monthlong standoff with demonstrators demanding new elections. 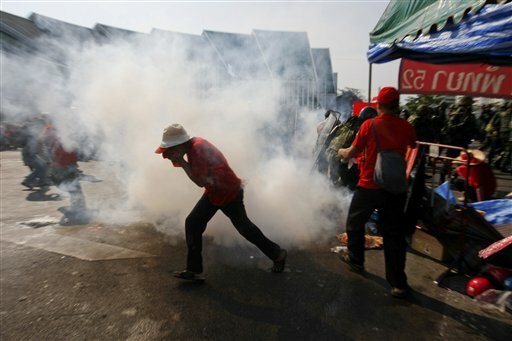 It was the worst violence in Bangkok since more than four dozen people were killed in an antimilitary protest in 1992. Bullet casings, rocks and pools of blood littered the streets where pitched battles raged for hours. Army troops later retreated and asked protesters to do the same, resulting in an unofficial truce. Four soldiers and 11 civilians, including a Japanese cameraman, were killed, according to the government’s Erawan emergency center. The savage fighting erupted after security forces tried to push out demonstrators who have been staging a month of disruptive protests demanding that Prime Minister Abhisit Vejjajva dissolve Parliament and call new elections. The demonstrations are part of a long-running battle between the mostly poor and rural supporters of former Prime Minister Thaksin Shinawatra, and the ruling elite they say orchestrated the 2006 military coup that removed him from power on corruption allegations. The protesters, called “Red Shirts” for their garb, see the Oxford-educated Abhisit as a symbol of an elite impervious to the plight of Thailand’s poor and claim he took office illegitimately in December 2008 after the military pressured Parliament to vote for him. 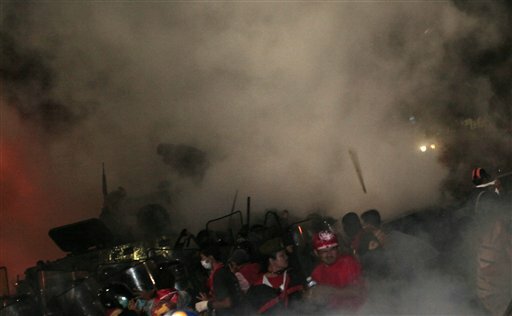 Saturday’s violence and failure to dislodge the protesters are likely to make it harder to end the political deadlock. Previously, both sides had exercised considerable restraint. Abhisit “failed miserably,” said Michael Nelson, a German scholar of Southeast Asian studies working in Bangkok. Tanet Charoengmuang, a political scientist at Chiang Mai University sympathetic to the Red Shirt’s cause, said he expects the fighting will resume because the protesters are unafraid and the government refused to listen to them. Abhisit went on national television shortly before midnight to pay condolences to the families of victims and indirectly assert that he would not bow to the protesters’ demands. “The government and I are still responsible for easing the situation and trying to bring peace and order to the country,” Abhisit said. The army had vowed to clear the protesters out of one of their two bases in Bangkok by nightfall, but the push instead set off street fighting. There was a continuous sound of gunfire and explosions, mostly from Molotov cocktails. After more than two hours of fierce clashes, the soldiers pulled back. Army spokesman Col. Sansern Kaewkamnerd went on television to ask the protesters to retreat as well. He also accused them of firing live rounds and throwing grenades. An APTN cameraman saw two Red Shirt security guards carrying assault rifles. At least 678 people were injured, according to the Erawan emergency center. The deaths included Japanese cameraman Hiro Muramoto, who worked for Thomson Reuters news agency. In a statement, Reuters said he was shot in the chest. Most of the fighting took place around Democracy Monument, but spread to the Khao San Road area, a favorite of foreign backpackers. Soldiers made repeated charges to clear the Red Shirts, while some tourists stood by watching. Two protesters and a Buddhist monk with them were badly beaten by soldiers and taken away by ambulance. A Japanese tourist who was wearing a red shirt was also clubbed by soldiers until bystanders rescued him. Thai media reported that several soldiers were captured by the protesters. Red Shirts also staged protests in several other provinces, seizing the provincial hall in the northern city of Chiang Mai, Thaksin’s hometown. On Friday, the police and army failed to prevent demonstrators from breaking into the compound of a satellite transmission station and briefly restarting a pro-Red Shirt television station that had been shut down by the government under a state of emergency. The humiliating rout raised questions about how much control Abhisit has over the police and army. Thailand’s military has traditionally played a major role in politics, staging almost a score of coups since the country became a constitutional monarchy in 1932. The Red Shirts have a second rally site in the heart of Bangkok’s upscale shopping district, and more troops were sent there Saturday as well. The city’s elevated mass transit system known as the Skytrain, which runs past that site, stopped running and closed all its stations. Merchants say the demonstrations have cost them hundreds of millions of baht (tens of millions of dollars), and luxury hotels near the site have been under virtual siege. Arrest warrants have been issued for 27 Red Shirt leaders, but none is known to have been taken into custody. At least four soldiers and four opposition protesters have been killed during clashes in the Thai capital Bangkok, with at least 500 others injured. The figures were given by Bangkok’s deputy governor. A bomb went off near the office of Prime Minister Abhisit Vejjajiva but no one was injured. Red-shirted protesters hurled rocks as troops tried to clear them from the capital’s historic district. Riot police responded by firing rubber-coated bullets and tear gas. Tensions have been escalating as mass protests are entering their fifth week and supporters of ousted Prime Minister Thaksin Shinawatra keep defying a state of emergency in the capital. The protesters in Bangkok, numbering tens of thousands, are calling for the resignation of Prime Minister Abhisit Vejjajiva and fresh elections.